Men and women have been utilizing aromatherapy essential oils for as far back as the Egyptians to treat numerous health and medical conditions, including hair loss. It has been found that some essential oils could actually help hair growth, this is thought to be because of their ability to stimulate hair follicles. This type of stimulation appears to help in increasing the blood flow which helps to carry the nutrients so important to the hair follicles. At Aberdeen University’s department of dermatology, the researchers conducted a seven-month study of the use of essential oils to treat Alopecia Areata. The eighty-six alopecia patients were randomly divided into two groups. The first group was required to massage essential oils (rosemary, lavender, rosemary, lavender, and cedarwood) which were in a used in a mixture of carrier oils (grapeseed plus jojoba) on to their scalp on a daily basis. The second group was only given only carrier oils for their trial, which was also massaged daily on to the scalp. The results found that in the first group that 44% of the patients displayed improvement as opposed to 15% of the patients in the second group. The results of the trials concluded that aromatherapy was considered to be a rather safe and pretty effective treatment for alopecia. Perhaps given that it makes the head tingle a bit, that peppermint oil has been long been rumoured to possess properties that help hair growth and there may be something in this. A research trial reported in the 2014 December issue of The Toxicological Research Journal it was reported that mice that were given a topical application of Three percent peppermint oil showed better hair growth compared to those given minoxidil, a placebo or jojoba oil. The authors of the above report noted that a peppermint oil application encouraged very thick and long hair in the mice after four weeks with no signs of any toxicity. Using cedarwood aromatherapy oil is said to help stimulate the blood circulation of the scalp and may, therefore, assist in promoting hair growth. Cedarwood aromatherapy oil is also thought to have anti-fungal properties that help to protect the scalp from fungal infections that may stop hair from growing healthily. Lavender aromatherapy oil is combined with many hair care treatments, lavender essential oil is obtained from the scented lavender flowers. Lavender aromatherapy oil has strong antiseptic properties which will help eliminate germs that clog up the hair follicles and cause infection, which may lead to hair loss. 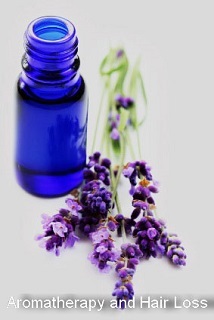 Lavender essential oil can also be considered a stimulant which assists to improve the circulation of blood within the scalp thereby preventing hair loss due to poor circulation.